Last month, we told you that the display on several BlackBerry KEYone units were popping off the phone on impact. At first, it was believed that the screens did not have any adhesive on them to keep them in place. However, BlackBerry Mobile did say that it used adhesive, but obviously one that was not strong enough to do its job. The company said that it would find a better adhesive for use on newly produced units. And that was the last we heard about the matter until now. Yesterday, on its @BBMobile Twitter page, BlackBerry Mobile left a link to a posting made by a member of the BlackBerry Mobile support team. The message relayed the latest information about the BlackBerry KEYone. 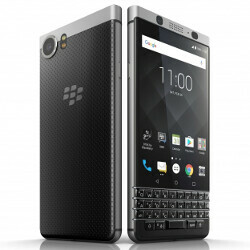 To insure that KEYone owners have an "outstanding experience," BlackBerry Mobile has taken steps to add extra strength and adhesive to the screen on the latest models rolling off the assembly line. These new units are already being added to the phone's inventory found at retailers and the manufacturer's retail partners, and will continue to be added throughout the summer. What about those who have already purchased a KEYone prior to the changes that were made? In that case, BlackBerry Mobile says that those older units are under warranty and owners should contact BlackBerry support for a warranty replacement. With a superb physical QWERTY keyboard and tremendous battery life, the KEYone has become the sleeper hit of the first half of 2017. But with the model up against some pretty stiff competition like the Samsung Galaxy S8 and the HTC U11, BlackBerry Mobile can ill afford to have an issue like this negatively affect the progress it has made with consumers who have been tremendously pleased with the phone. Blackberry is known for these types of things. Remember all those trackball issues, crooked track pads? Their first touchscreen devices were a mess as well. I think the Keyone is a step in the right direction, but if Blackberry wants to still be a player in the hardware game it has to keep up and try to appeal to people other than blackberry enthusiasts. This is a BlackBerry Mobile/TCL issue, not a BlackBerry issue, since they are the ones that handle the hardware for BlackBerry (in addition to two other companies), and they've fully acknowledged the issue and presented a solution rather quickly, as opposed to blaming the user or downplaying it. However, I would like to see BlackBerry themselves thoroughly examining the hardware a lot more going forward, since they do put their stamp of approval on all of the devices branded with their name. Blackberry can't seem to get their devices right. Just look at the Priv and the many issues that plagued it, in addition to not having Nougat and probably won't ever get Nougat. Lol, funny how you never say anything like that about your deity Apple when they mess up with bending iPhones, iPhones that lose a signal when held a certain way and they blame the user, and buggy software updates that break functionality on the phone every time they release them. Funny you call Apple my deity just because you're deflecting from the truth. I mean it's not like the Priv didn't have those issues. Oh wait, it did. So you have no room to talk about someone having an OEM as a deity when you are far more guilty than anyone else. Lol, I call Apple you're deity because that is the truth, and you're deflecting from that. I mean, it's not like the iPhone in all of its iterations didn't have issues. Oh wait, they did. So you have no room to talk about someone having an OEM as a deity when you are the most guilty party here. At least I call BlackBerry/BlackBerry Mobile our when they mess up. You never do they with your deity Apple. You just deflect and run defense. And this isn't me deflecting and denying the issue like some people do. Except that no one deflected or denied the issue like you do with Apple. You're just trying to pick a fight, as usual. Haven't you gotten slaughtered in enough articles here by enough people already? I didn't point out any particular names, so obviously you must be guilty if you're that triggered by my comment. Actually I haven't been getting slaughtered. Nice try. I didn't say that you did. You made a general statement and I proved that statement to be false. Reading comprehension clearly isn't your strong suit, and now you're triggered because I proved you wrong. Yes toy have, but nice try lying about it. So why are you wasting my time then? Oh that's because you were triggered by what I said despite the denial. Yes toy what? Lol, what the what? You're clearly triggered because I made a comment that proves yours wrong. But go ahead and continue to live in denial if that's what helps you sleep at night. *Uses the word "of" instead of the word "if" in his comment #24. Technically it's Blackberry Mobile, not Blackberry, in charge of this. Blackberry Mobile is a brand under TCL. And I have to say that Blackberry Mobile is one of the few manufacturers that are at least being upright and honest about fixing the issue. OnePlus won't even acknowledge problems that are of their own making. Very well done BB!! Not even richer fruit organizations would take responsibility of their flawed design, not without getting sued first. Kudos on doing the morally correct thing...starting to think I should just grab one for the sake of supporting such organization. That's how HTC did it with the Evo screen, and Samsing with the Note 7 battery. Kudos BB, acknowledge your mess up, fix it and move on. That's how it's done. No you're holding it wrong, or only 6 bent crap. Just own it, fix it, and move past it. Just like Shamesung fixed the S8 lagging or allowing people to remap the Bixby button? Awesome to see that BlackBerry Mobile/TCL has stepped up to the plate and has taken full responsibility for the issue, as well as having presented a fix for it. I really like the fact that they are exchanging devices with the issue for a new one without the issue, as opposed to issuing a "bumper", downplaying the issue, or blaming it on user error like a certain famous tech company has done. Kudos to you, BlackBerry Mobile/TCL. How dare you mention "bumper"! Prepare to be shown no mercy. Lmao! I know, right? Now I have to prepare for his merciless fury, lol. Stares in a mirror, says no mercy, no mercy, no mercy. You two shouldn't jockride each other in public. Your tears of anger and frustration over the truth amuse me. Your tears if butthurt and denial is even more amusing. *of Your lame "butthurt" response clearly describes you. *uses the word toy instead of you No it doesn't, alphageek. Stop projecting. *Uses the word "of" instead of the word "if" Yes it does, mxyflashmxy2starkmite. I purchased a Sam S8+ back in may and I have to say that it's a phenomenal phone, top notch everything! but when I played with my friends BB keyone for some 5 mins I have to say that I kind of regret for my decision! I mean there is absolute no way you can compare S8 to Key1 but the phone has a charm! quick note dough! make it a little thinner! better screen! (you don't want to compare these phones screens side by side! and of course better internals, water proofing, etc. I forgot to mention that the keypad screen scroll thing has an annoying lag! so (software optimization is very very welcomed). The S8 has its issues, but at the current price of the KeyONE, I would suggest the S8 over the KeyONE. The KeyONE is lacking in the specs department compared to the S8. Maybe if the KeyONE was just a bit cheaper. Not surprised with the KeyONE having an issue with keyboard lag. Blackberry seems to have trouble with Android devices given the Priv and its many issues.